The brand-new LUX user interface makes the Clevertouch a beautiful and intuitive experience through an expertly designed touch interface familiar to any owner of a modern smartphone or tablet. The interface has been designed to give you a quicker, simpler, smoother experience. No one wants to press ten buttons to open an app or connect to their laptop. With LUX, all of your everyday tasks are just one-touch away. The Clevertouch is by far the most intuitive Interactive Flatscreens on the market today. We’ve looked at them all and nothing compares to the accuracy and reliability of a Clevertouch. 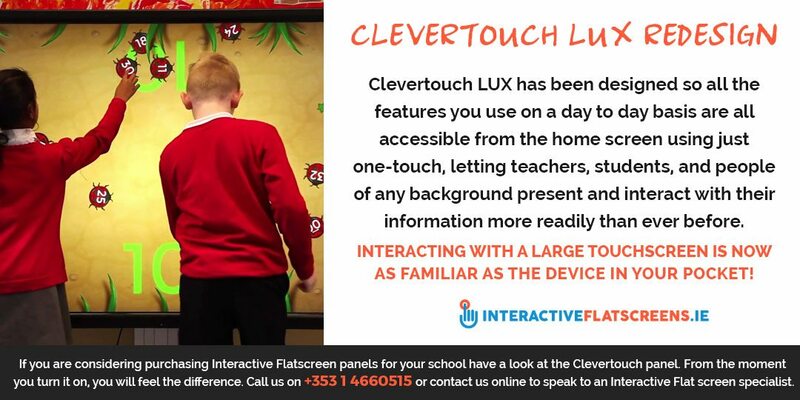 Clevertouch LUX has been designed so all the features you use on a day to day basis are all accessible from the home screen using just one-touch, letting teachers, students, and people of any background present and interact with their information more readily than ever before. 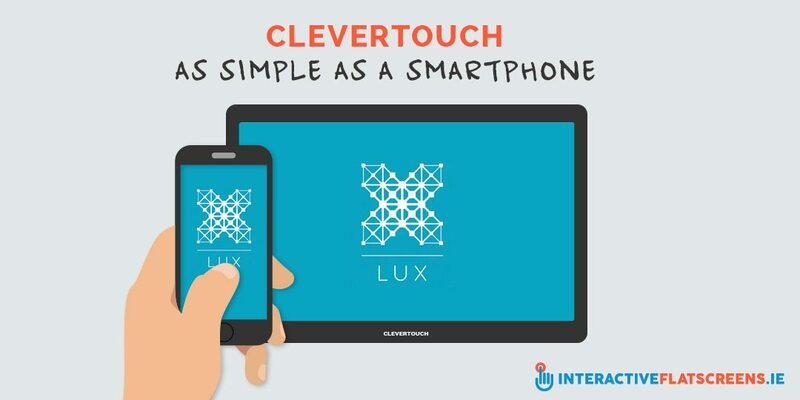 Clevertouch have taken their design cues from what is around us all: smartphone and tablet technology. They believe in making the interface as simple to use as possible. If making a new folder is something you can do in seconds on your phone, then you don’t need to reach for a guide to do the exact same thing on a 65″ screen! Even switching between inputs, such as the slot-in PC or a connected Mac, it’s just a swipe up and one-touch and your second input loads. There is no unplugging, no configuring, no technical settings to adjust. Just swipe, touch and load. LUX values your time, and makes sure every interaction is a great experience. We believe, with LUX, Clevertouch has built the first glimpse of the future of touch interfaces for large-format displays. The Clevertouch V Series is the perfect solution for a budget conscious touchscreen. It has all the essential features of a Clevertouch, but without the Cleverstore or integrated apps of the Plus or Pro range. Much of the software and all the accessories of the Pro and Plus range are available as optional extras for the V Series. This is our best-selling panel presently. The V Series should not be taken lightly. It is ideal for use in professional settings such as offices, reception areas, meeting and training rooms, yet robust enough for use in schools, colleges and universities. 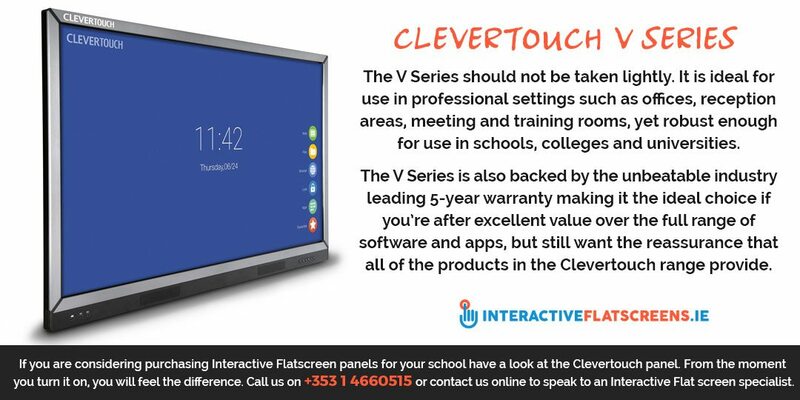 The V Series is also backed by the unbeatable industry leading 5-year warranty making it the ideal choice if you’re after excellent value over the full range of software and apps, but still want the reassurance that all of the products in the Clevertouch range provide. If you are considering purchasing Interactive Flatscreen panels for your school, have a look at everything that’s out there, then, come and have a look at the Clevertouch panel. From the moment you turn it on, you will feel the difference. Call us on +353 1 4660515 or contact us online to speak to an Interactive Flat screen specialist.